34 • May 2018 • S I G N & D I G I T A L G R A P H I C S DIGITAL PRINTING AND FINISHING DIGITAL GRAPHICS but are also capable of fitting into their workspace. As a result, manufacturers are trying to scale back the footprint of their products without losing capability." He points out that when flatbeds first came into the market, the focus was to improve or replace labor-intensive print- ing processes like printing onto film and then laminating that print onto rigid sub- strates. 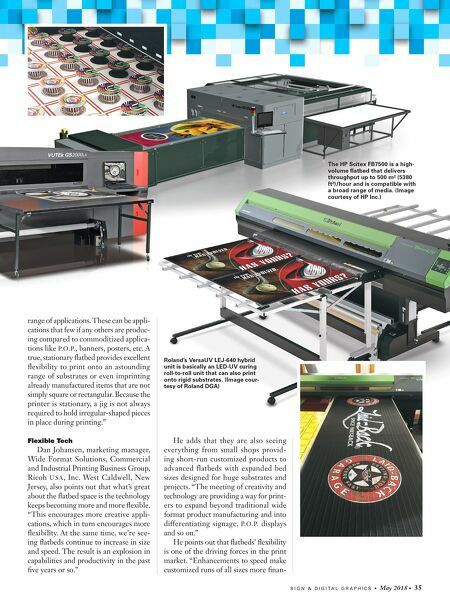 "Flatbeds allowed direct-to-substrate printing, which removed that middle step of mounting and laminating and reduces the possibility of handling mistakes. Since then, printers have been push- ing the envelope on the materials being printed. They were no longer limited by matte or glossy film." Heavy-Duty Output Options Maxwell says that advancements in flatbeds and their inks have enabled printing onto materials like natural wood, stone, and metals to be incorpo- rated into the design. This has allowed digital printers to expand their portfo- lio of design possibilities beyond effects that could be created with roll-to-roll machines. "Designs are also expanded with the ability to build up ink. True UV flatbed ink enabled texture effects to add dimensionality to the images. To create ink or printed effects generally, multiple layers are printed of the same parts that are to create the raised texture. You can do this on flatbeds because the media position is fixed and high repeatability accuracy for ink buildup is required," Maxwell adds. 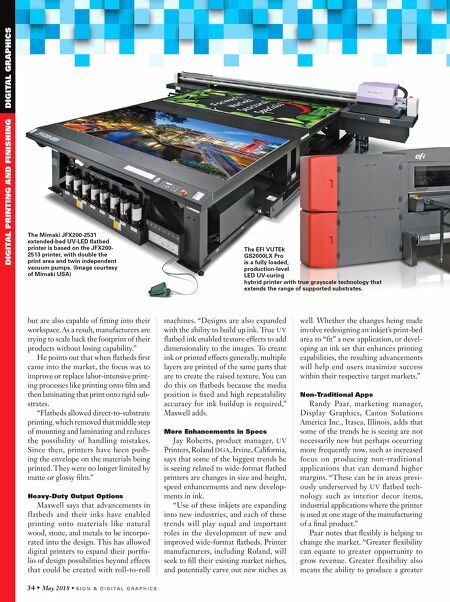 More Enhancements in Specs Jay Roberts, product manager, UV Printers, Roland DGA, Irvine, California, says that some of the biggest trends he is seeing related to wide-format flatbed printers are changes in size and height, speed enhancements and new develop- ments in ink. "Use of these inkjets are expanding into new industries, and each of these trends will play equal and important roles in the development of new and improved wide-format flatbeds. Printer manufacturers, including Roland, will seek to fill their existing market niches, and potentially carve out new niches as well. Whether the changes being made involve redesigning an inkjet's print-bed area to "fit" a new application, or devel- oping an ink set that enhances printing capabilities, the resulting advancements will help end users maximize success within their respective target markets." Non-Traditional Apps Randy Paar, marketing manager, Display Graphics, Canon Solutions America Inc., Itasca, Illinois, adds that some of the trends he is seeing are not necessarily new but perhaps occurring more frequently now, such as increased focus on producing non-traditional applications that can demand higher margins. "These can be in areas previ- ously underserved by UV flatbed tech- nology such as interior decor items, industrial applications where the printer is used at one stage of the manufacturing of a final product." Paar notes that flexibly is helping to change the market. "Greater flexibility can equate to greater opportunity to grow revenue. Greater flexibility also means the ability to produce a greater The Mimaki JFX200-2531 extended-bed UV-LED flatbed printer is based on the JFX200- 2513 printer, with double the print area and twin independent vacuum pumps. (Image courtesy of Mimaki USA) The EFI VUTEk GS2000LX Pro is a fully loaded, production-level LED UV-curing hybrid printer with true grayscale technology that extends the range of supported substrates.